Girly girl or tom boy? I pretty much fit into both categories depending on the day and/or my mood! That is why I was too excited when I saw Jo from iCurvy‘s latest pin choice for her Spin The Pin fashion blog link up! I play along every month for two reasons; firstly because I love being involved in a good fashion challenge, and secondly because I’ve found this is one way I’m forced to shop in my own wardrobe and wear items in different ways that I normally wouldn’t. Last month was all about pattern clashing, and June brought pastel to a whole other level, but this month it’s hard meets soft, and it got my brain ticking. What to wear? Here’s this months pin from blogger Meri Wild. But first – what’s Spin The Pin? In Jo’s words. So what’s the idea? 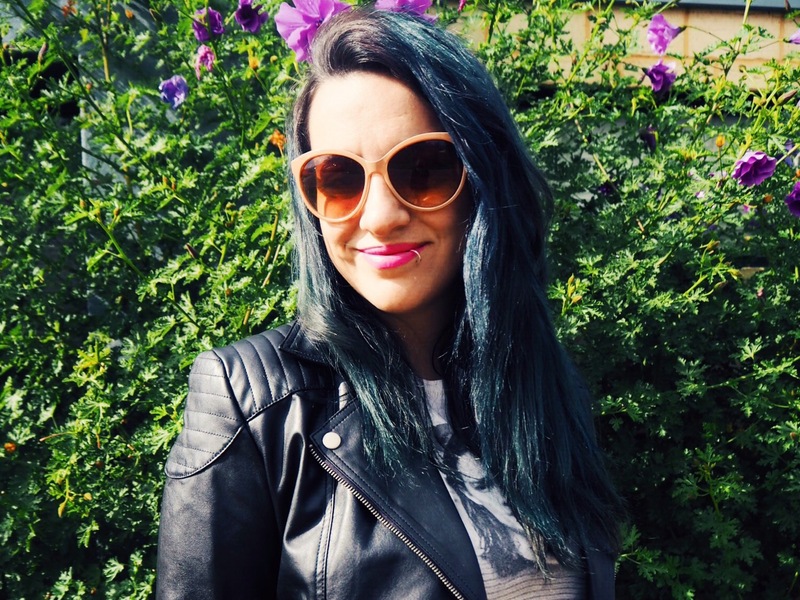 Each month I’ll be picking a Pinterest Image – an outfit for some inspiration. I’ll be posting my outfit, or my ‘Spin’ on the ‘Pin’ and opening up a link party for all of you to post your ‘spin’ on the outfit too! Although Jo’s pin choice features a tutu, I decided to keep it me and go for a vintage midi skirt that is still as loud as the pin, but something I felt more comfortable wearing. 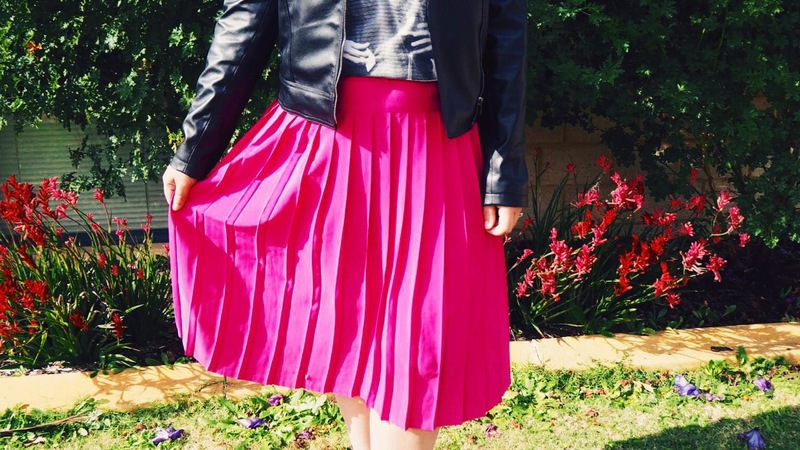 I love the idea of a full ballerina skirt, but I took this look out during the day and I think the bright pink was enough of a stand out. 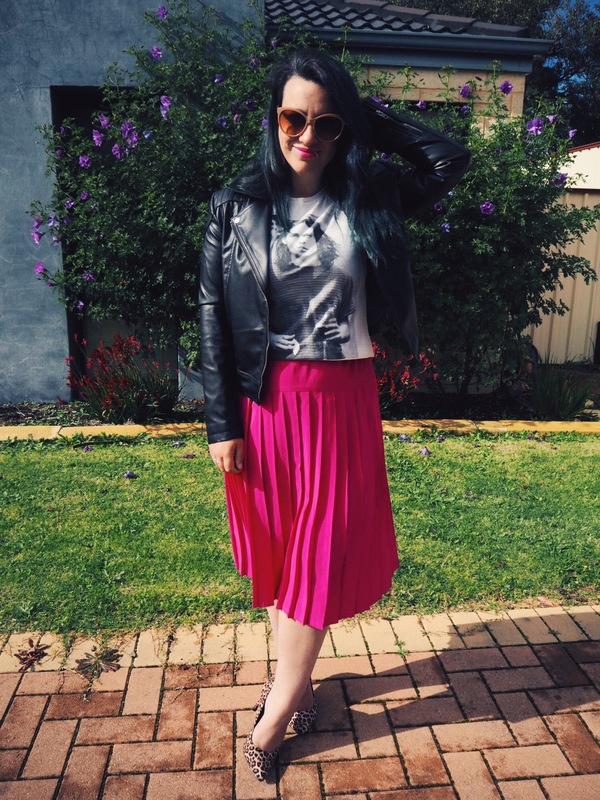 I picked up this skirt a few months back at a “garage sale” organised by a few Perth creatives, and I was very happy to take it off Emma from Dropstitch‘s hands! I love Emma’s style, and it’s too cool to have one of her past pieces in my wardrobe. This was the first time I actually wore the skirt. Does anyone else have a wardrobe filled to the brim with unworn items? Oops! What I love most about it is the lady like pleats. Fancy much! 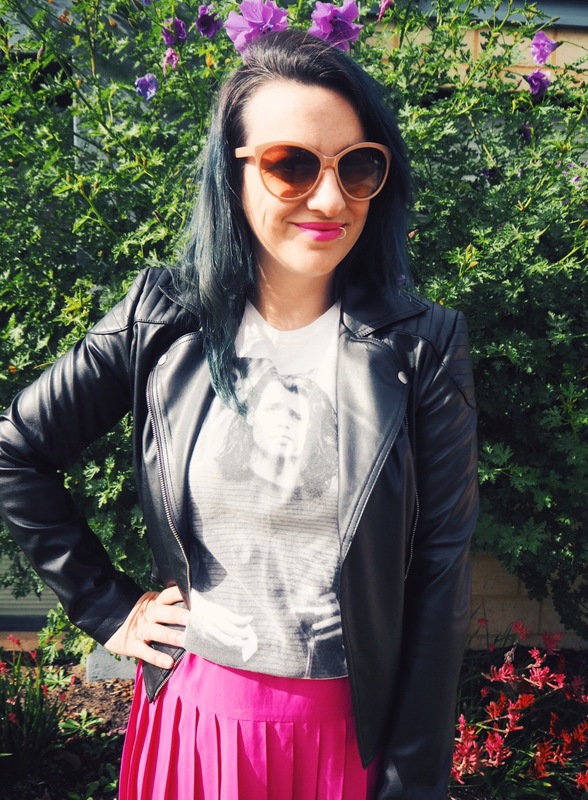 The skirt oozes girly glam, so I decided to keep the rest of outfit quite hard, and my new James & Co vegan leather biker (more about that jacket here) paired with a Dangerfield tee featuring the one and only Johnny Depp did the trick. If he’s not tough, who is? I just have to say I love Dangerfield’s range of printed tees. They fit great, they’re quirky and I love the range of pictures available. Check them out! The pin this month has been so much fun! I think I’ll have to mix genres more often! Do you think you’ll try it too? I think you should, and you should definately link up with the Spin The Pin link up – find it here. Are you a girly girl or a tomboy? Do you mix the two? James & Co jacket gifted for my opinion. All views are my own. Love that bright pink. Love that jacket. What a fun thing to do each month. I am far less adventurous. Love the idea – very cool! I am pretty keen on contributing! Do it hun! I’d love to see your take! Depending on the day I too can either be a girly girl or a bit of a tomboy. I don’t really mix the two up. After seeing your outfit however I will consider it in the future. Thanks Bev! I think I’ll have to harden up all my girly dresses with my jacket. You should join in Lydia, it is so fun! Hahaha I didn’t even think of Grease, but i guess it kinda is!!! It was a challenge, that’s for sure, but you have to give it a go lovely! As Jo said, choose one element you love and just go for it! What a fabulous look! 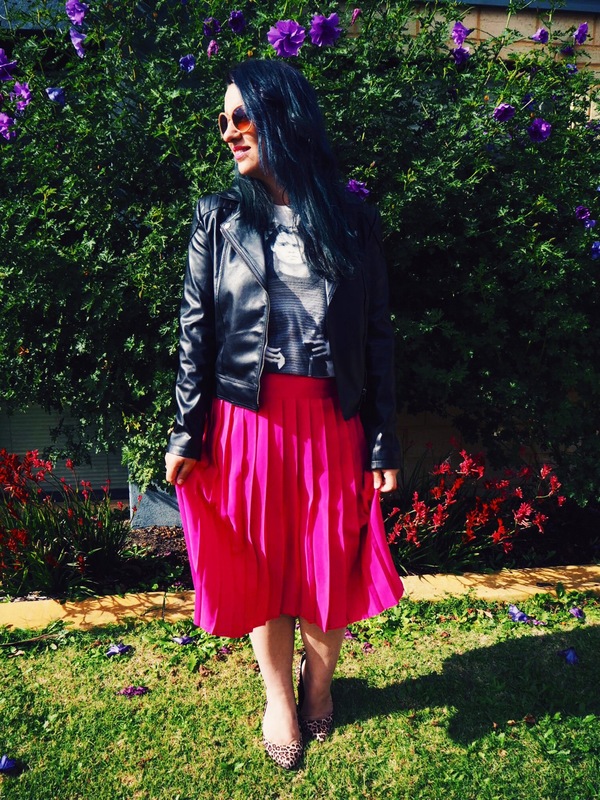 The bright pink skirt pairs so well with the leopard heels, and the biker jacket just oozes sophistication. Great job! Im loving the colour of that skirt! Gorgeous! This outfit looks like so much fun! Its totally giving me a t-bird cross pink ladies feel! Nice job! Haha love that everyone has seen “Grease” I didn’t notice that Til afterwards!